Technically, the word "Hold'em" refers to the some-cards-in-your-hand/some-cards-on-the-board, four betting rounds structure. But it has commonly become associated with the Texas version. Texas Hold'em is generally considered "Hold'em", while Omaha Hold'em is merely "Omaha." Birthed of the same mother structure, Omaha and Hold'em have similarities, but like siblings they also have dramatic differences when it comes to winning strategy. Understanding these sibling differences can lead to each of us making better game selection choices and recognizing our own strengths as poker players. Some of the differences stem from logistics. When playing in a casino, Texas Hold'em is played No Limit and only rarely Limit. Omaha is usually played Limit High-Low, and then less commonly Pot Limit High or Pot Limit High-Low. Even more rarely is it played No Limit High-Low or Limit High-Only. 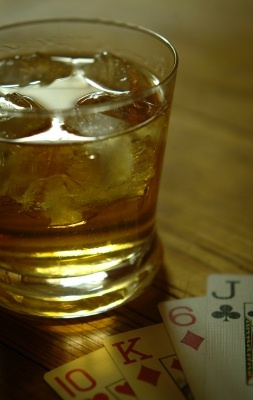 Texas Hold'em players usually have a wider variety of games to choose from. Omaha games have more regulars. Besides these things, there are many complicated differences, especially when comparing Limit Texas Hold'em and Limit Omaha High-Low. If your aim is to win, Limit Hold'em requires more risk-taking, more fluctuations. Winning Limit Hold'em is all about exploiting tiny edges, and even more, creating tiny edges. Hold'em skill often comes into play in turning 55/45 edges into 60/40 ones. Obviously that is a good, profitable thing to do, but just as obviously it takes something of a long run to make these small edges add up. Great Hold'em players find nickels and dimes and dollars of value in hand after hand -- getting free cards, protecting (or not protecting) blinds, value betting, inducing bluffs, etc. Very good winning players don’t depend on showing down AK against KQ on a KJ742 board. Showing the best hand is the bedrock of winning, but it is merely the tip of the iceberg. For very good players, Omaha edges are usually huge. Against weak Hold'em opponents, a very good player can play a lot more hands. This is not the case in Omaha. While 76s can sometimes become playable in Limit Hold'em, 9764 is never playable in Limit Omaha High-Low (outside of maybe a head-up game) regardless of how lousy your opponents are. While the faster-paced Limit Hold'em is all about the application of many tiny edges time and again, glacier-paced Limit Omaha High-Low is more about waiting for rare instances of enormous advantage. These huge advantages occur because most players simply do not "get" that when played properly Omaha has very little gamble to it, with less playable hands than Hold'em -- especially playable hands per hour. Loose-ish Omaha games mostly come down to simple math. A pot has so many chips in it, and you have so many outs to make the winning hand. You are either getting the right price, the wrong price, or the very, very right price. Omaha is tortoise poker. Hold'em is for the rabbits. Generally, winning Limit Omaha High-Low players make more money per hour than equally skilled Limit Hold'em counterparts. This occurs despite more Hold'em hands being played simply because most Omaha players play far worse than the average Hold'em player. If a weak player is taking the 40/60 worst of it in Hold'em many times, that player is taking the worst of it fewer times against Omaha opponents, but the worst of it now is more likely to be 10/90. Your personal temperament might be better suited for one than the other, but one game is not "better" than the other. While Omaha games of all the different types should be easier money for a skilled player, these days Texas Hold'em games of all types offer a much wider array of opportunities to win. Omaha tournaments are still peopled with very weak Omaha players, but the sheer number of Hold'em tournaments and the larger amount of people playing Hold'em events offsets that. Smaller edges in more events with more people simply returns us to the basic difference between Omaha and Hold'em -- you get to apply a small advantage much more often for larger bets. Profit comes in different ways, and you have to be capable of catching it.